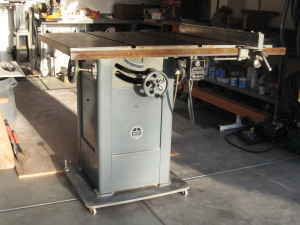 Found this vintage Walker Turner 10" Table Saw on Craigslist. It's the full cabinet version of the saw with large cast iron top. It rips up to 23 1/2 inches wide. It came with the original Walker Turner Driver Line motor. Has original hand wheels, electricals, Driver Line miter gage and rip fence. Just purchased a model like yours. Going to need some parts. What do you recommend as the best source for parts for these oldies but goodies? I've had the same WT 10" table saw as in the picture since 1962. I disassembled, cleaned, lubed, aligned it in 1965. It has been in at least weekly use ever since. Tomorrow I'm treating it to a new 12" blade so I can do some large, compound angle cuts. Have used it on everything from Balsa, through every wood known, plastic, Plexiglas and lexan sheet 1'8" through 3/4" and for aluminum sheet up to 1/2". It is carefully cleaned every week and the leads spritzed with a little WD-40. My table side extensions disappeared during a move from Dallas to Richmond and I never really liked the rip fence (kind of flimsy for my taste). Great piece of machinery, going to my son when I croak - or can't use it anymore.